This screen will display on the main window by default, so you can choose a color scheme and typography for your project beforehand. If you would like to change the color scheme and typography later too, you can do it easily by selecting the General tab –> Scheme. TemplateToaster provides the flexibility to change the text style anytime during the designing process. TemplateToaster avails you with the hundreds of pre-installed color schemes which are BOOTSTRAP based. You can see all the color schemes by scrolling the list down and choose the desired-one for your project. For defining the text style of your template/website, you are given typography options such as Font Family, Font Size, and Line Height. You can specify the font size and line height in the corresponding boxes given or go with the default values. 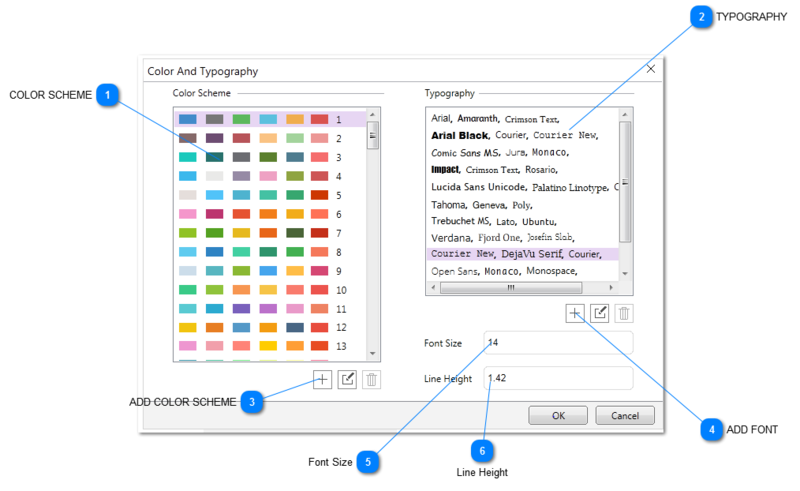 Even you can customize your own color scheme with “+” button given under the color scheme list. When you click this button, the More Schemes dialog will open as shown below. 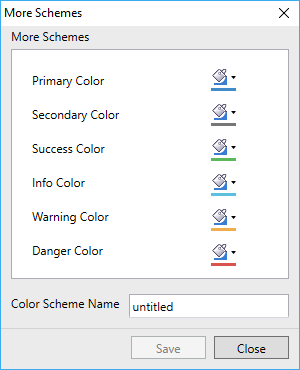 You can select different Primary, Secondary, Success, Info, Danger, Warning colors to specify a new color scheme and name it as you wish. For details, check out More schemes section. When you click the “+” button under the typography list, a new dialog will appear as shown below. In this Custom Fonts Dialog Box, you can browse more fonts from a huge collection of Google Web Fonts, Custom Fonts and System Fonts. So, you can add any font to the Typography list according to your need. 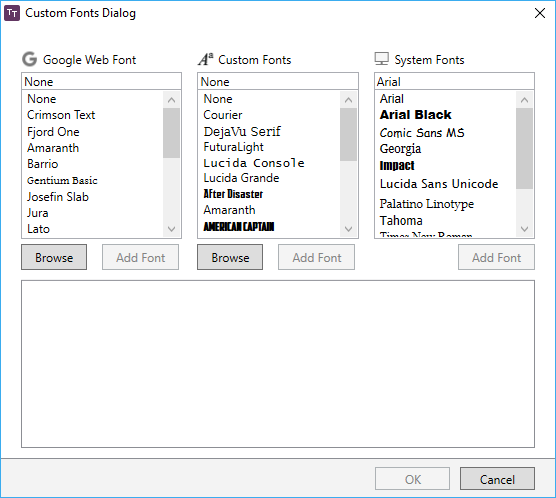 For more details, Custom fonts dialog section. In this text box, you can specify the required font size for the chosen typography scheme. By default, it’s 14. This is to specify the line height where the default line height is 1.42. You can make changes as per your need.